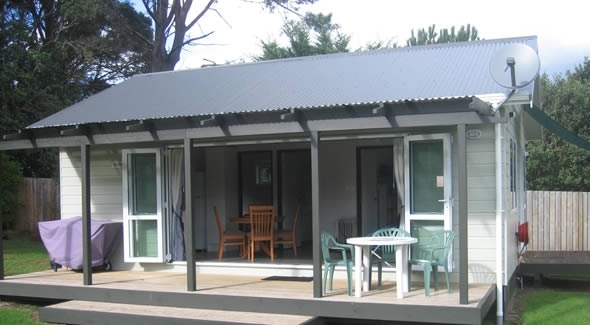 Our four fully self-contained two-bedroom cottages are in garden setting with covered Decks, private grass area, carports and individual storage lockups. Two of our fully self-contained, cottages are set on a rise among the pohutukawa trees, with extensive sea and island views. These modern 2-bedroom homes feature full laundries, bath, shower, full kitchen, lounge, heat pump, carports and storage lockups. Ranchsider doors open to large decks and private lawns just a short walk to the beach. Our original beach cottage was built in 1937. The construction materials were brought in by barge and the cottage has withstood the test of time, weathering cyclones and storms. It has all the charm and character of yesteryear. Built of native kauri and rimu, it features a large clawfoot bath and pit-sawn wood lining. These are now complemented by new insulation: electric stove and gas fire. The cottage deck leads to a large front lawn which stretches out to the estuary and acres of wildlife refuge, adjacent to 30km of white sandy beach. Our free-standing self-contained studio unit with ensuite bathroom is a smaller but comfortable alternative to our cottages. 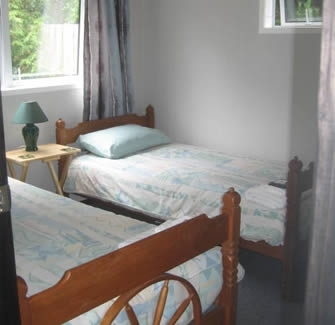 Situated just behind the sand dunes just a short distance to the beach.